Nantwich Town and fellow seventh-tier side Bognor Regis Town have both landed National League opposition in the draw for the semi-finals of the FA Trophy. Northern Premier League side Nantwich will meet the winners of the quarter-final replay between FC Halifax and Gateshead, which ended 0-0 at The Shay on Saturday. Isthmian League high-fliers Bognor play 2013 beaten finalists Grimsby Town. The two-leg semis will be played on successive weekends (12 and 19 March). 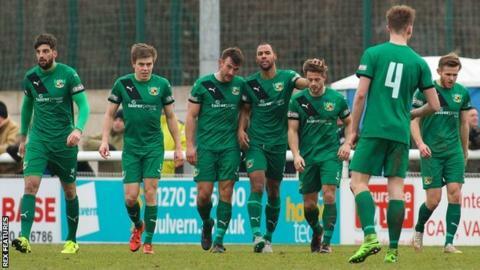 Nantwich, bidding to become the first FA Vase winners to go on and win the Trophy, needed a last-minute header from Liam Shotton to beat National League side Dover Athletic 2-1 on Saturday. Bognor Regis Town also beat National League top-flight opposition, Snore Nilsen heading the only goal of the game against struggling Torquay United. Grimsby progressed with two goals from winger Nathan Arnold to see off National League rivals Woking 2-0. Gateshead and Halifax will meet again at the International Stadium on Wednesday to to decide who heads for Cheshire to meet Nantwich on 12 March. For the first time, Wembley is to stage both major non-league finals - the FA Trophy and the FA Vase - on the same day this year, Saturday, 22 May. The Vase has also reached the semi-final stage. Hereford FC, in their first season in their new guise following the closure of Hereford United in December 2014, play another 'Phoenix' club Salisbury, who also reformed this season after being expelled from the Conference. In the other two-leg semi-final, Essex Senior League side Bowers & Pitsea will host Northumberland side Morpeth at the Len Salmon Stadium on 12 March, with the second leg to follow a week later. Tickets for Non-League Finals Day are already on sale (£25 for adults, £10 for concessions and £1 for Under-16s).